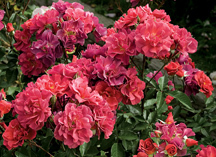 Cinco de Mayo is just one of the many wonderful floribunda roses we’re offering this year. The color is an indescribable blend of rust-red and lavender-smoke. It’s very rounded and bushy. Get the complete list of what’s available on our Roses page.